Bluetooth, Uconnect, Keyless Entry, Air Conditioning w/ Dual Climate Control, Heated Steering Wheel! If you've been seeking a family vehicle with more attitude than the typical crossover, this Dodge Durango is worth a look according to Edmunds. 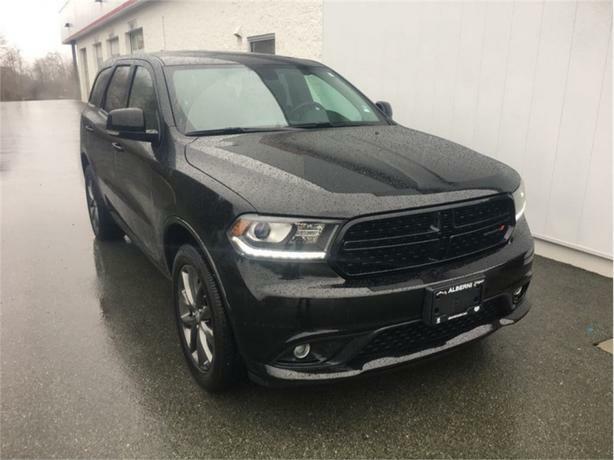 This 2017 Dodge Durango is for sale today in Port Alberni. This Dodge Durango offers drivers the best of everything. It starts with a well-appointed interior with a generous amount of room for cargo and passengers. Muscular styling sets this Durango apart from the softer crossovers on the market. Impressive confidence comes from a powerful, yet efficient drivetrain. The standard all-wheel drive capability is balanced by plush, upscale interior details making for a well-balanced, family friendly SUV. This SUV has 25773 kms. It's black in colour and is completely accident free based on the CarProof Report. It has an automatic transmission and is powered by a 3.6L V6 24V MPFI DOHC engine. This vehicle has been upgraded with the following features: Bluetooth, Uconnect, Keyless Entry, Air Conditioning W/ Dual Climate Control, Heated Steering Wheel, Leather Faced Heated Seats, Second Row Heated Seats. It has some remaining factory warranty for added peace of mind. Our Durango's trim level is GT. The 2017 Dodge Durango GT provides comfort for your adventure with heated leather seats, cruise control, and dual-zone climate control. Other features on this trim include power windows, remote keyless entry, push button start, Uconnect with Bluetooth, 2 USB ports, a heated steering wheel, a rearview camera, remote start, a universal garage door opener, and more. To view the original window sticker for this vehicle view this http://www.chrysler.com/hostd/windowsticker/getWindowStickerPdf.do?vin=1C4RDJDG9HC905212.